A trodden floor and stone tools from over 120,000 years ago. They are proof of human life on Wolf Mountain before the Ice Age covered the land for thousands of years. Wolf Cave is a unique attraction; there is nothing like it anywhere else in the Nordic countries. 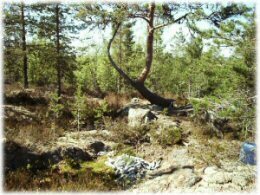 The terrain around Wolf Cave is abundant with signs of the Ice Age, and the cave itself is the oldest known human dwelling in Finland. Wolf Cave and the surrounding environs tell a story from thousands of years ago. Wolf Cave is located in Ostrobothnia on the borders of Karijoki municipality and city of Kristiinankaupunki. It is the most important archaeological site of Finland and it is visited by thousands of people yearly. These pages provide information about the cave itself, exhibitions, services and other local tourist attractions in the area. Our pages also include our contact information and a Contact form that you can use when wanting to give us feedback or making closer inquiries of our services. We warmly welcome you to the magical feeling of past in the Wolf Cave! Wolf Cave is a wide horizontal crevice in the primary rock and is named for its location on Wolf Mountain. The cave was formed as a result of erosion, and it is estimated to be more than 2.6 million years old. In the interglacial period, when the sea level was just outside the mouth of the cave, it was filled with layers of sediment and remained untouched, even though the cave is widely known in the area. The cave opening is 116.5 meters above the current sea level, and the ceiling of the cave is 2.2 meters high at the highest point. It is difficult to precisely determine the size of Wolf Cave because it is still partially filled by sediment layers, but it is estimated to be over 400 m². 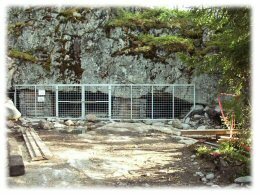 Wolf Cave is situated in city of Kristiinankaupunki, but land-owner is Karijoki municipality. This cave is so far the only place on earth where evidence of human inhabitancy has been found in a place that was later, during the ice age, covered by a continental glacier. Wolf Cave is northern Europe’s oldest known human dwelling site. It is very difficult to collect information about humans in Finland prior to the last ice age. In most places the last ice age destroyed evidence from the warmer interglacial periods of previous ice ages. Wolf Cave is like a small pocket that succeeded in avoiding the destruction. Because of this the cave is an exceptionally valuable research site. In the sediment levels of Wolf Cave we have found evidence of human habitation that includes stone tools, stone chips left from the making of such tools and old hearth remains. Based on the sediment level in which these artefacts were found and age calculations from analysis of pollen samples, these artefacts are estimated to be at least 120 000 years old. This means Neanderthals must have dwelt in the cave prior to the last ice age. It is even possible that they were there during one of the warmer breaks in the Saale Glaciation, the ice age that preceded the last ice age.